Udon soup is on the menu for lunch today. I've posted the chicken version of this soup before, but something prevented me from actually posting the recipe that evening (probably just too lazy). 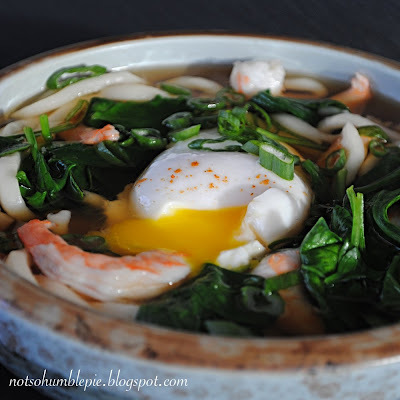 So, this is a dashi based broth, with fresh baby spinach, shrimp, poached egg, and spring onion. Cooked chicken works equally well in the place of shrimp. In a saucepan with several cups of water and a teaspoon of rice vinegar, poach 4 eggs for 2 1/2 - 3 minutes. Remove the eggs from the hot water, place in a bowl of cold water to prevent them from cooking further and set aside. Meanwhile, heat 5 cups of water over medium heat and add the dark soy sauce, light soy sauce, vinegar, mirin and granulated dashi. Bring to a simmer, cover and reduce heat to low. In a large pot of lightly salted boiling water, cook the udon for 3 minutes and divide into 4 bowls bowls. Refill the pan with more hot water and bring to a boil. Add the spinach and cook for 20 seconds until bright green and slightly wilted. Remove from heat and squeeze the excess water from the spinach. Divide the spinach between the bowls and top each with a poached egg. Add the cooked shrimp to the simmering broth and poach briefly, just long enough to heat them through (about 20 seconds) and then ladle the shrimp and the broth into the bowls. If using raw shrimp, add them to the simmering broth and cover. Within about 3-5 minutes the shrimp should be opaque, bright pink and cooked through. Top the bowls with a little chopped green onion, sprinkle the egg with a little cayenne pepper and serve. omg that looks beautiful!!! i must make this! Oh can I fly over for lunch? lol This post just made me really hungry, and esp. hungry for some Japanese cuisine, which is my favorite! 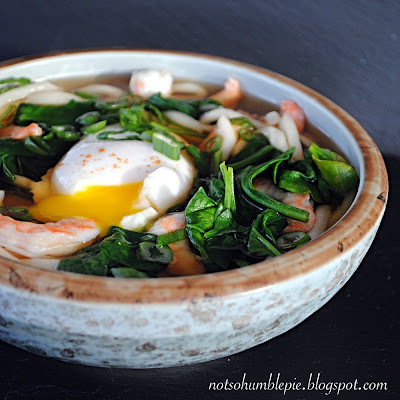 I especially like it that you're udon is made with shrimp and baby spinach. I think baby spinach works better with tender shrimp meat since it has a softer taste, if that makes sense? I guess I would love it! Mmmm...my freezing feet think that soup looks lovely! Yum! I've been craving udon and your recipe looks delicious. Oh course I'll be making them (possibly this month if time permits). I've been dreaming up flavors for months now and I've been wanting to test out a few new ideas. French macarons are just gorgeous fodder for blogs, all those pretty colors! I go into a trance just looking at them. I've never seen such a neat poached egg! Seriously, not even in restaurants. What's your secret? A gentle vortex in the water (putting the egg in the center) and a little rice vinegar in the water helps the egg white set neatly. The spinach have a lot of nutrition properties as not only provides energy and strength, plus they are light and don´t have a single gram of fat. So spinach can help us even to keep a good shape. And can help you even in your sexual performance for all vitamin that this plant contain. In some cases when you´ve tried everything,is better to buy viagra i have no complain about this product, just the opposite.